I’m going to start by saying, I don’t think she ate it as what most of my local friends would have done. Instead, I’ll highlight one of the best dishes I ever ate on the planet. I’m sure my other locals would not have called the Department of Agriculture. In a big pot, one that will fit the whole crab, saute the onions in 2 tablespoons of butter. Once the onions get translucent, add the flour. The flour will get a little dark as it cooks with the butter. Don’t stop stirring. We are doing this to thicken up the soup. After the flour has turns brown like the sand, slowly add the water. Continue to mix as you add the water to avoid clumps. Then add the coconut milk, juice, grated coconut, salt, pepper, the rest of the butter, and finally the crab. Bring to a boil and then reduce heat and let simmer for 15 minutes. Serve with rice. Here’s the article. If you live in a warmer climate, you’re likely no stranger to catching critters in your home or yard – – but what one woman in Hawaii tackled outside her house is exceptional. Holly Cantere saw this large, illegal coconut crab walking down the street of her neighborhood a little before noon on Sunday, Dec. 21, KHON-TV reports. It’s the first one officially spotted since 1989. Cantere was gutsy enough to trap the large creature in a box and call Hawaii’s Department of Agriculture (HDOA). 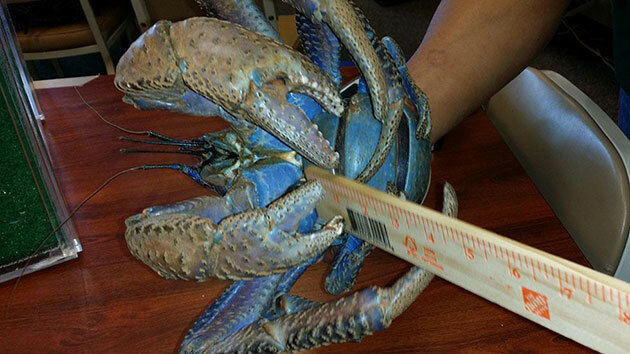 Coconut crabs are the largest arthropods on earth, according to the University of Hawaii. Originally found in the Indian and Pacific Ocean regions, the creatures can grow up to three feet large. Their size makes them hungry creatures, and as Smithsonian.com reports, they’ll feast on anything from chickens to kittens to each other. Their voracious appetite earns them a spot on HDOA’s list of illegal creatures. Investigators aren’t sure how this particular crab ended up on the busy road, but they hope it’s an isolated incident.